The Pale Project Exhibition, launch night, 14th November 2016. With thanks to Marian Keyes, staff of dlrLexicon, the Dun Laoghaire Rathdown County Council Arts Office. Photo credits: Peter Cavanagh. Image: Anthony Kelly, Field Notes for the Leadmines, joint Pale Project with Padhraig Nolan. On Wednesday May 4th, The Pale Project proudly presents the last Salon Night in the Studio Theatre at dlrLexicon at 8 pm. 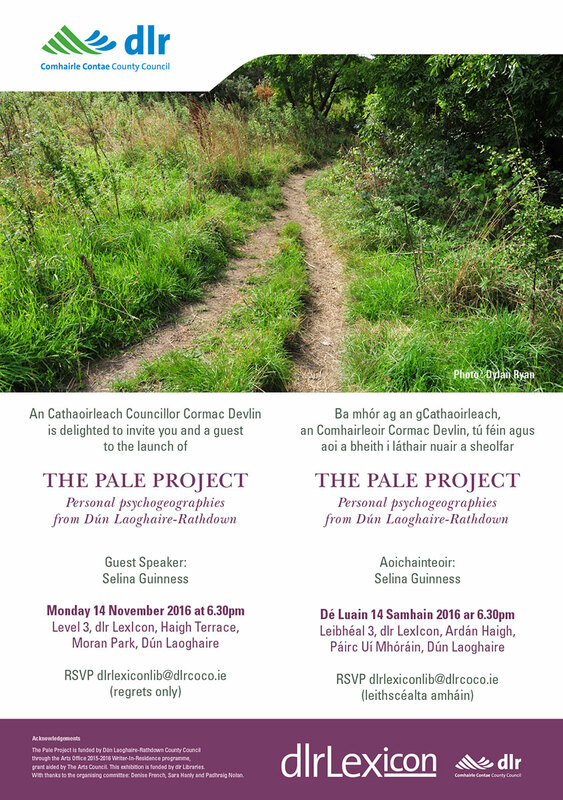 Join participants from The Pale Project workshop to discover anew the county’s ‘pales’: from Dalkey Island to Carrickgollogan, Bulloch Harbour to Balally, Churchtown to Shanganagh. We promise an entertaining night of fresh new writing, anchored locally, but thrown open to the world. The salon will afterwards adjourn to its customary saloon, Arthur McKenna’s bar on Wellington St, Dun Laoghaire. Amy Herron introduced proceedings, telling us that the eight soap-boxers were given a brief to take: ‘All adventurous women do …” as a starting pont, and that each person would speak for four minutes, from a rather precarious and wobbly box in front of the microphone which almost became a performer in its own right as the night wore on. Lisa O’Neill sang us in with ‘The Lass of Aughrim’, in her powerful, distinctive voice. How do singers do that, in a crowded room? It’s a mystery to me, but no trouble to Lisa, apparently. Here’s a very useful directory of poetry sites put together by Peter Raynard in what appears to be a typically generous and altruistic post from Proletarian Poetry. I have started a list of poetry podcasts, audio and video recordings of different organisations and initiatives. I have not included individual poets because that is beyond me. Please add other audio and video recordings I will have missed in the comments section. Happy listening and viewing! Lia Mills responds to Joanna Walsh & Claire Louise Bennett, Salon Night, 4/11/2015 with Gorse. Two comments stood out for me at the second Salon organised by Dun Laoghaire writer-in-residence Selina Guinness (4th November). Susan Tomaselli, editor of the fabulous Gorse literary journal, had invited Joanna Walsh and Claire Louise Bennett to join her on the panel. Selina Guinness and her guests covered a lot of ground, but these two remarks struck me forcibly enough that I’ll just put them in front of you and let them speak for themselves. At last night’s Pale Project, one of the members produced a sketch of an emotional map of her Pale. Her initiative threw up a surprising result: in the areas of greatest natural beauty in her Pale, the map recorded sadness and anxiety; in the most anonymous spaces where trespass was already evident, the map recorded happiness. Today I came across this organisation, thanks to Mark Joyce. These thoughts carried into the discussion at Salon Nights at the Studio with Claire Louise Bennett, Joanna Walsh and Susan Tomaselli. Both writers opened up new avenues for writing about displacement and desire; and how to find a form of writing that retains the joy of the unsettled and contingent self. Auto-fiction was the term Joanna used, but it seemed to me there were maps here too, the home-space charted in Claire-Louise’s Pond: the cooker with its missing control knobs, the pattern of stones in the cottage wall. Hotel – the Freudian memoir by Joanna Walsh, published today by Bloomsbury – makes this an explicit subject for analysis. I’m not yet sure how these things all mesh, but it feels like a fertile matrix.